In this situation, you set up a trust to provide income for the life of your spouse, with the capital remaining at the spouse’s death to go to the children or grandchildren. This type of trust is common when a spouse is ill or incapacitated or lacks financial expertise. A variation of this format, if there are no children or grandchildren, is to leave the capital to charity, on the death of the surviving spouse. 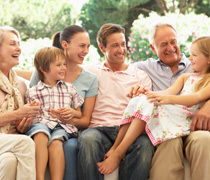 You may already have in your will that in the event that both parents die at the same time, or when the surviving parent dies, that a portion of your estate shall be held in trust for minor children or grandchildren until they reach a certain age. In the meantime, the trustee can pay out the income and encroach on the capital for specific needs of the children. Many people then arrange to have the money disbursed over various time periods as the children mature, for example, one-third at age l9, one-third at age 25, and one-third at age 30. You may wish to set up a trust that provides family members with income for life, but on their death the remaining capital in the trust is distributed to a charity of your choice. You could have a child who has a history of financial irresponsibility. One solution is to set up a trust to control the funds or assets that the child would otherwise receive. The trustees would have the power to distribute as much of the income as appears reasonable for the child, with any excess income being re-invested in the trust. There could also be a power to use some of the capital as necessary in extenuating circumstances. On the death of the child, the capital in the trust could go to the grandchildren, for example. If you have a family member who is physically or mentally challenged and not able to manage their own affairs, you may want to consider a trust. That way, you would have the assurance that the needs of the child would be looked after from the interest on the capital of the trust, with encroachment powers on the capital in extenuating circumstances. Any excess interest would be re-invested in the trust and added to the capital. If it appears that the trust would be operating for an extended time, it is prudent to consider the benefits of having a trust company as trustee or co-trustee. There could be situations where it would be to your distinct advantage to establish an international trust if considerable assets are involved, e.g. over $1 million and the circumstances make such a choice attractive. This type of trust should be considered when you want to gift money to close family members living outside Canada, or when you anticipate receiving money from close relatives outside the country.